Last updatit on: 8 Julie 2012. 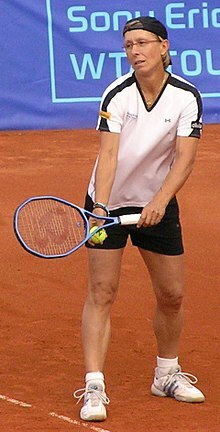 Martina Navratilova (Czech: Martina Navrátilová; born Martina Šubertová; October 18, 1956) is a retired Czech American tennis player an coach, an a umwhile Warld No. 1. Billie Jean King said aboot Navratilova in 2006, "She's the greatest singles, doubles an mixed doubles player that's iver livit." ↑ Bonnie DeSimone (September 11, 2006). "Act II of Navratilova's career ends with a win". ESPN. Retrieved February 14, 2007. This page wis last eeditit on 2 Februar 2017, at 22:39.